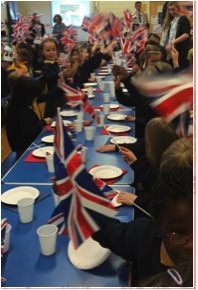 St Aloysius' School was a sea of red, white and blue last Thursday, to celebrate The Queen's 90th birthday. A special tea party started with a presentation made by Mr. Walker about Her Majesty. Then all the children stood up to sing a hearty rendition of God Save The Queen. When everyone was seated again, staff and parents served the children with various sandwiches, Victoria sponge and squash - everyone agreed that it was all very yummy! We finished with a prayer specially written for the occasion.